Yield: Yields about 3 cups. It might seem like this recipe calls for a lot of garlic and very few potatoes, but boiling and mashing them together with butter and cream delivers just the right amount of mellow garlic flavor. 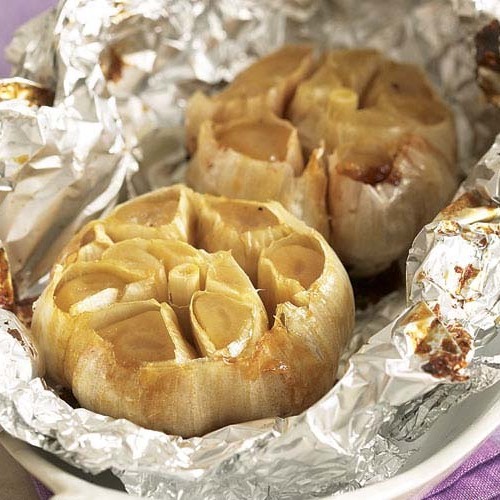 Cut the garlic cloves in half lengthwise and remove the germs. Put the potatoes and garlic in a 3-quart saucepan. Add the bay leaf, 1 tsp. salt, and enough cold water to cover the potatoes by about 1 inch. Bring to a boil over high heat. Reduce the heat to medium low, partially cover the pot, and simmer until the potatoes are very tender when pierced with a fork but not falling apart, about 20 minutes. Drain in a colander; discard the bay leaf. Add the light cream (or milk) and butter to the warm pan. Pass the potatoes and garlic through a ricer or the finest disk of a food mill directly into the pan. Set the pan over low heat and stir until combined and heated through. Season to taste with salt and pepper. Serve immediately or keep warm for up to 1 hour in a heatproof bowl covered tightly with foil and set over a saucepan of barely simmering water. For the easiest way to peel garlic, check out our test kitchen secrets. This recipe was ok. Nothing different from the method I usually employ. I made it the day before, which should have intensified the flavor - it did not.If you are used to bland potatoes this might be a new spin for you - try it.When I make mashed potatoes, I warm the milk, butter, cream, garlic etc in a separate pan to avoid the gummy results.